A Dialogue of NudesThe Villain of the Armory Show? The 69th Regiment Armory every day seems more out of place in skyward-bound Manhattan. As the real estate boom at the top end of the economic scale continues, and the city proposes new rules to increase the height and density of skyscrapers on the East Side, the rounded heap that is the Armory, like some massive sleigh bed – headboard on Lexington Avenue and footboard Park Avenue – seems of an entirely different era. The Armory and the buildings that were going up around it provide a sense of these tensions. A block from the Armory was McKim, Mead & White’s Madison Square Garden (1890), a Moorish-inspired pleasure palace of multiple theaters and a vast arena. Taking up two full blocks between Seventh and Eighth Avenues was McKim’s greatest work, Pennsylvania Station, which rose up on the west side of Manhattan between 1906 and 1910 while New York’s other great railroad station, Grand Central (1903–13) was rising on the east. These low-center-of-gravity buildings were overtaken by the exuberant “vertical monumentalism” of corporate skyscrapers. One of the first was just a block from the Armory: the Metropolitan Life Insurance tower (1909), inspired by the four-hundred-year-old campanile in Venice. 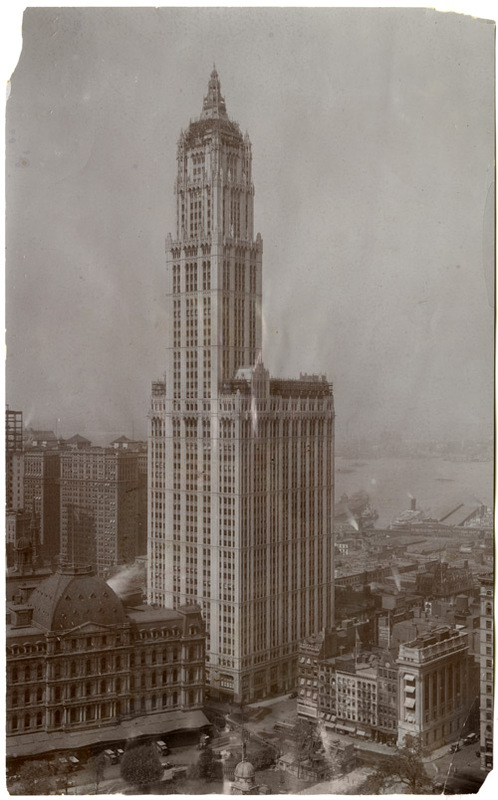 It was the world’s tallest building until it was eclipsed when Woodrow Wilson pressed the button to illuminate the new Woolworth Building, just six months before the Armory Show opened. These Madison Square neighbors – one solidly anchored to the Manhattan grid, and the other soaring high above it – exemplified New York’s grandest efforts to erect monuments that would resist the ravages of time and the city’s appetite for change. William R. Taylor and Thomas Bender, “Culture and Architecture,” in Visions of the Modern City: Essays in History, Art, and Literature, William Sharpe and Leonard Wallock, eds. (New York: Columbia University, 1983; repr., Baltimore, Md. : Johns Hopkins University Press, 1987).